Low-pressure injection has become the choice of both contractors and do-it-yourselfers when it comes to repairing concrete cracks. First of all, low-pressure injection is done from the interior of the home, eliminating a ton of time and costs associated with digging the outside foundation wall. For contractors, this gives you a lot of advantages; the biggest being a reduction of the expenses for your jobs. You do not need specialized equipment, and a dual-cartridge injection gun only costs a fraction of the price of a high-pressure injection machine. To fill a typical crack in a residential foundation wall, the low-pressure injection will give a complete repair. Since the outside of the foundation wall will act as a sturdy wall barrier, making sure every portion of the crack is filled. If done from the exterior, the resin could leak on the inside of the foundation because it has no barrier to hold it in. Even in the case of a wall barrier, at higher pressures, the liquid has enough force to overcome gravity and rise through the crack without filling the backside, which is typically narrower than the front of the crack. The entire process from start to finish will typically only take a few hours since you do not dig, set up your machine, and then close up what you uncovered. This way, it is entirely feasible to perform many jobs in a single day, and if you manage a team, you can have multiple repairs going on simultaneously since they do not need to rely on cumbersome and difficult to transport equipment. If you're starting out as a contractor, you don't need to purchase a heavy vehicle or trailer for your gear either. All your low-pressure injection tools can fit in the trunk of a small car. There's another advantage of low-pressure injection: If done right with the correct materials (like Flexomeric flexible resins), the repair is usually warrantied for life. Most contractors are so confident in our product that they go beyond and offer a lifetime transferable warranty, which makes it an attractive bonus for homeowners that are selling their home. 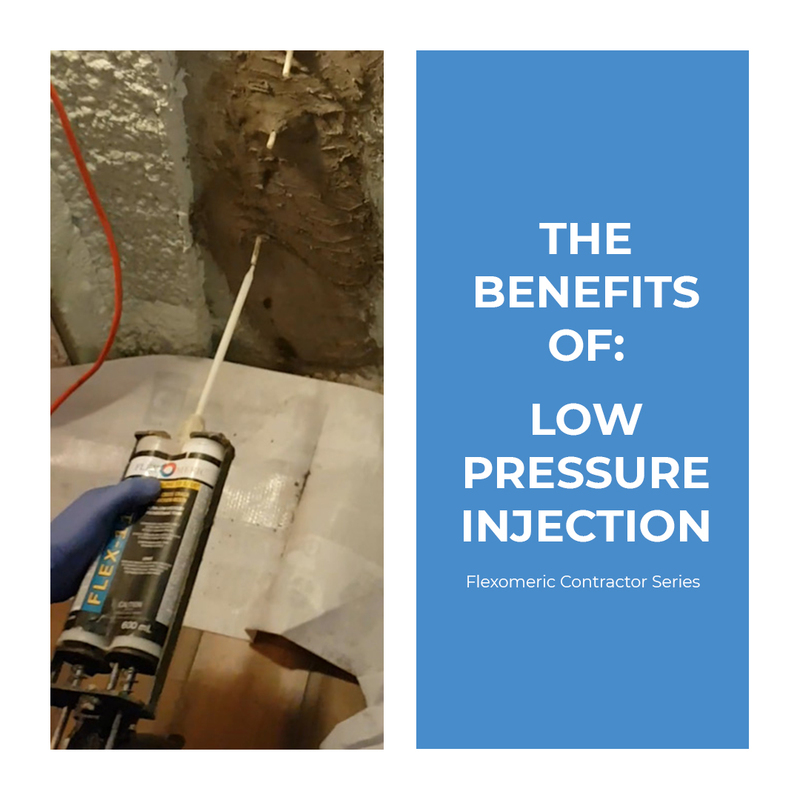 For homeowners, low-pressure injection is easy enough for any do-it-yourselfer to do and uses the same method and materials that a professional waterproofing contractor would. We've built kits with simplified tools to facilitate your repair project!